Born in April 2006 Performance 2 Way Racing Communications had 1 goal in mind. Providing the BEST in Racing Communications at a Price that wouldn’t kill your Budget. Performance 2 Way Racing Communications is quickly becoming the New Standard in Racing Communications, We pride ourselves on the Customer Support you deserve and the Best Bang for your Money Communications systems on the Market. 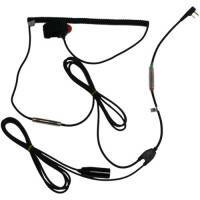 Description: Helmet Microphone and Ear Piece for use with Performance 2 Way radio systems.